DuBoulay's Suncoast Cafe has amassed a major following since it opened in 2010. Ask chef Tony DuBoulay, the big guy who looks even bigger with his dreadlocks tucked into a tall white chef’s hat, why his little Suncoast Café at the Venice Airport has amassed such a following since he and his wife Deb opened it in 2010, and he says, “The food.” Deb laughs. “It’s great food,” she agrees. “But it’s Tony—his personality. 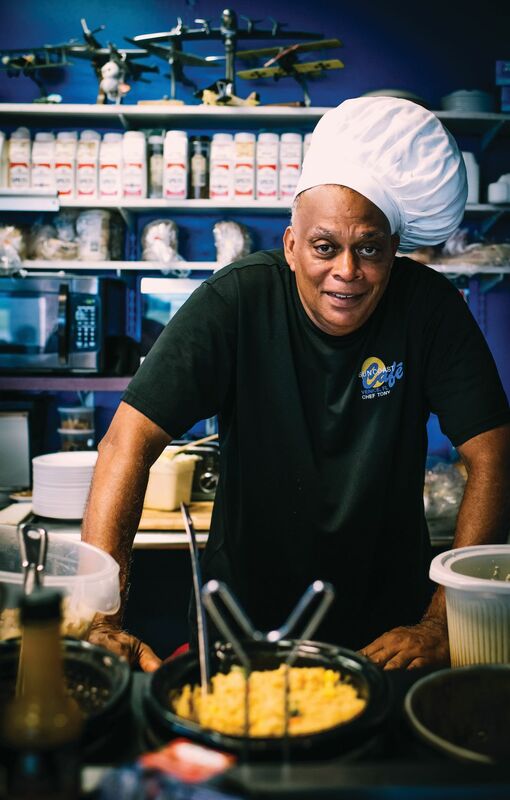 I’ve never seen a restaurant where the chef is so much the star of the show.” As the St. Lucia-born DuBoulay, 56, and his small staff juggle pans behind a tiny counter, customers vie for his attention, trading greetings and banter. But they get quiet when their orders—maybe a colorful quesadilla with roasted pork, peppers and a side of plantains or a flaky goat roti—arrive.